Three women gathered outside the door. One, almost 6 feet tall and broad, stood with two smaller women. One was petite with curly hair, and the other was thin with a drawn and angular face. I had seen them before. They were discussing a patient’s lunch and the fact that she hadn’t eaten. But it was not about the patient’s health. “She didn’t eat it?” asked one. “It’s still on the table,” said another. I was listening. I recognized the voice of the tall one. “She ordered from outside,” said another. Strange that I’m reflecting on those days this morning. I think it’s because I’m feeling luxuriously at ease within the sanctity of my bedroom. Maybe it’s because I’m indulging in nourishing, health giving food—green drinks, fresh fruit, foods I can enjoy now that I’m home. Perhaps it’s because I’m watching the snow melt and enjoying the morning sun at the top of the trees. Mean-spiritedness is a trickle-down reaction. It trickles down from families, communities, politics and religion. Remember that trickle-down theory of economics? I thought you might. These women hated their jobs. Most were immigrants receiving the lowest wages for the funkiest work: emptying bed pans, making beds, giving showers, and wiping up vomit or worse. I understood, but after waiting 3o minutes, I ordered pizza from a community restaurant and had it delivered to my stinky room. Something occurs to me. The mean-spiritedness I experienced with the nursing assistants is the same and equal to the mean-spiritedness of religious extremists — of all faiths. Only the environments have changed. Religious extremists fight – even crazily to the death — for control of our personal lives. Is it because these extremists’ lives are so rabidly out-of-control? Is it because they feel powerless in the face of their own human nature — just as the nursing assistants feel powerless in the face of their jobs? Is it because they fear something within themselves that they advance racist fears, the persecution of homosexuals, and a hatred of women? Is it because their own human urgings are out of control? When people can’t control their own lives, they try to control the lives of others. When people aren’t happy, they try to make others even less happy. We’ve heard that “if they knew better, they’d do better.” Hmm. 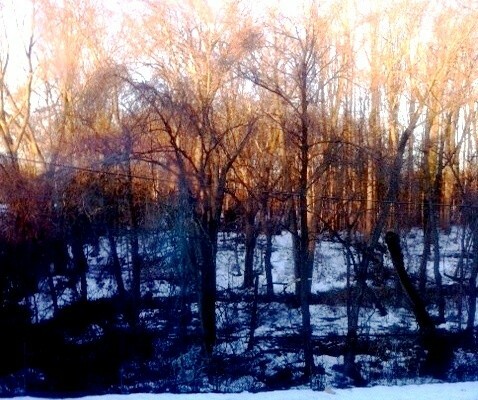 I’m watching the snow melt and enjoying the morning sun at the top of the trees. I’m so happy to be home. This entry was posted in Writing from the heart and tagged Commentary, creative nonfiction, creative writing, essay, Life Stories, values and spirituality, writing from the heart. Bookmark the permalink. W O R D S and receive notifications of new posts by email. © Copyright 2011-2019 Sala G. Wyman, W.O.R.D.S, and W.O.R.D.S Have color. Have vision. Have power -- Stories About Life... And Sometimes Food. All Rights Reserved. Links may be used when full and clear credit is given to Sala G. Wyman--and W.O.R.D.S, and W.O.R.D.S Have color. Have vision. Have power -- Stories About Life... And Sometimes Food. Just Pass the Grits. Okay? Boomeresq Traveling with humor and insight! Greater Good website I came across this site one afternoon while surfing. Love it! http://sarahsomewhere.com/ – wonderful, insightful, joyful Sarahs travels the inner and outer landscape with joy! Kristin Neff on self-compassion Ms Neff is doing some great research on self-compassion. https://www.icivics.org/ How does our political system work? Former Supreme Court Justice Sandra Day O’Connor is the chairperson of the board of this organization that helps folks understand the way our system works. Writing From the Heart, Creative non-fiction, Values and Spirituality, Memoir, Essay, Life stories, Reflection, Writing. Loving. Writing From the Heart, Creative non-fiction, Values and Spirituality, Memoir, Essay, Life stories, Reflection, Writing. Loving. Select Category African American Aging Commentary Creative Non-Fiction Essay Essay Family memories Food Gratitude Heart and Mind Humor Kindness Kindness Life Stories Memoir Personal Growth Philosophical rants Stories about life values and spirituality Women Writing from the heart Writing. Loving. Writing. Loving.